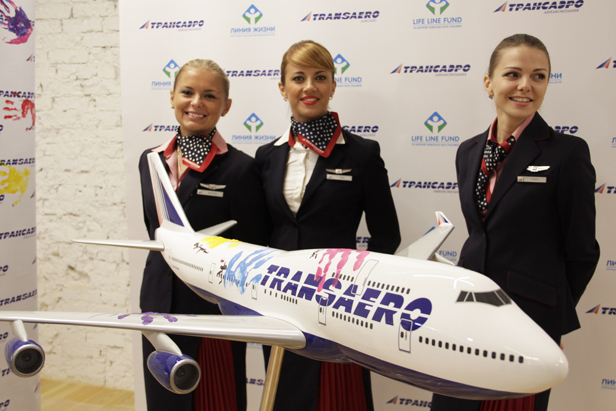 Transaero's fleet will soon see the appearance of an unusual aircraft: a Boeing 747 covered with multicolored handprints. For this is the plane that will carry out the "flights of hope," on board which passengers will be able to make donations to help children with diseases of the heart, brain, and spine. The meaning behind the palm prints is simple — passengers are holding out a helping hand to children in need. The first to lend a hand, quite literally, was Transaero CEO Olga Pleshakova. It happened at the presentation of the project at the Garage Art Center in Moscow. Her example was followed by some renowned Russian actors and writers. The first "Flight of Hope" is scheduled for mid-November, since the fuselage still needs to be decorated. The practice of collecting in-flight donations has been adopted by other international airlines, but this is the first time that a specially painted aircraft has been used. To begin with, the unorthodox Boeing will fly to Russia's Far East and the U.S., but will gradually start to show up on other key routes serviced by the airline.